I wanted to bring in my winter coat to the cleaners (maybe optimistically a week or so too soon) and in cleaning out the various pockets I came across some cash and a receipt dated last December. I thought about how long it has been since I have actually used cash. What a difference from my dad’s world. My dad dealt with millions of dollars every day as a comptroller and always carried a wad of cash worthy of a mafia don. I still have his money clip somewhere. I put the few bills on my desk as a reminder and then thought about how the world has changed. Paying in cash is certainly becoming less common. Most of my customers still pay me with paper or electronic checks, a few go through Paypal and every once in a while I get asked to accept credit cards. Now there are so many options for accepting Internet payments and two good ones that you might not know about. One is Simplify.com, which is part of MasterCard and has done a lot of work in developing their payment gateway. The other is Stripe.com. Both charge a bit less than 3% per transaction but have no other recurring fees. That is a lot less compared to just a few years ago, when you had to pay monthly processing and other annoying fees to have a merchant account. Stripe even accepts non-dollar currencies, including Bitcoins, and converts them into dollars for you. 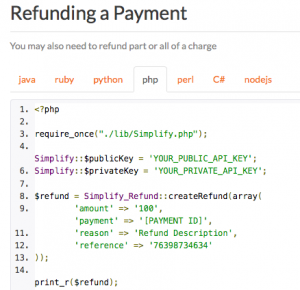 Both Stripe and Simplify offer a variety of APIs, tools, code samples, and connectors to various payment-related apps. I like the way Simplify arranges its code samples, as you can see in this screenshot. Stripe has more third-party plug-ins than Simplify, including more than a dozen just for WordPress. Both offer documentation on webhooks, which are URLs that can interact with short pieces of code for particular event notifications, although I think Stripe has better documentation. Both also support OAuth for consolidated signons to other SaaS apps without having to store your credentials. Finally, both can operate in either a testing or sandbox mode so you can try various things out, and then go live with actually processing real transactions. We have come a long way with online payments to be sure. Both services allow you to build in payment processing to your website in ways that were unthinkable just a few years ago. I think my dad would be just as amazed as I am. This entry was posted in App Dev tools, Web applications by dstrom. Bookmark the permalink. My readers have commented that Square Cash, Paypal and Dwolla.com are all alternatives if you don’t need programmatic access to your payment streams. I never use cash, and I eagerly await the day when I only have to worry about having my phone. . .When my ID’s are all accessible on my phone, when every place accepts my phone as payment. Of course, then if you lose your phone, you are totally SOL. Have you tried Apple Pay yet?